On October 2, prominent Saudi journalist/critic Khashoggi disappeared after entering the Saudi kingdom’s Istanbul, Turkey consulate, needing documents for his upcoming wedding, scheduled for this week. He hasn’t been seen or heard from since, likely victimized by foul play. Turkish officials believe he was murdered by a Saudi hit squad sent from the kingdom to eliminate him. According to Turkish police, 15 Saudis, including several officials, arrived in Istanbul on October 6. They entered the consulate when Khashoggi was believed alive inside. On October 7, Turkish/Arab Media Association head Turan Kislakci cited unconfirmed reports that he was killed in the consulate, his body dismembered, then removed undetected. Istanbul’s chief prosecutor initiated an investigation into what happened, including an examination of all video surveillance footage of consulate entrances, along with checking all inbound and outbound flights since Khashoggi’s disappearance. On Monday, Turkey’s Foreign Ministry asked permission to conduct a forensic search of the consulate, after Saudi envoy to the country Waleed AM El-Hereiji was summoned to the ministry for the second time. Crown prince Mohammed bin Salman (MBS) is ruthlessly intolerant of regime criticism. If proved responsible for Khashoggi’s death, relations with Turkey will likely worsen. His fiancee Hatice Cengiz waited for him outside the consulate. She disbelieves the regime’s explanation about his disappearance. Kingdom assassins likely murdered him. Its ruling are authorities contemptuous of civil and human rights, along with disdaining the rule of law. 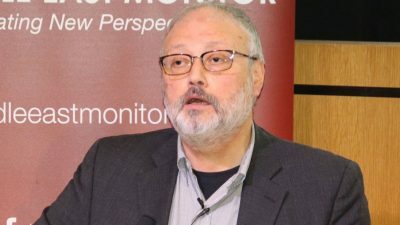 Khashoggi was likely abducted and murdered to silence his criticism. If proved, it’s unlikely to disrupt longterm bilateral relations America – notably strong since Franklin Roosevelt met with king Abdul Aziz in 1945. The kingdom’s likely responsibility for whatever happened to Khashoggi isn’t likely to change longterm US/Saudi relations.